NASA has unveiled "the most colorful view of the Universe" ever captured by the Hubble Space Telescope. Part of a study called the Ultraviolet Coverage of the Hubble Ultra Deep Field, it's "a composite of separate exposures taken in 2003 to 2012 with Hubble's Advanced Camera for Surveys and Wide Field Camera 3." Watch the extra large version of this image here. 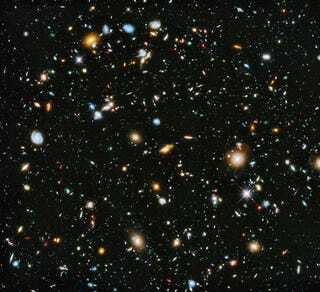 Previously, astronomers crafted the Hubble Ultra Deep Field image, using visible and near-infrared light photos of a small section of space in the constellation Fornax captured from 2003 to 2009. The new image uses every single frequency that the Hubble can register, from the ultraviolet to near-infrared light and going through visible light. The resulting image — made from 841 orbits of telescope viewing time — contains approximately 10,000 galaxies, extending back in time to within a few hundred million years of the big bang. According to NASA, until now astronomers didn't have enough data "for the period in between, when most of the stars in the universe were born — a distance extending from about 5 billion to 10 billion light-years." The project's principal investigator Harry Teplitz—of Caltech in Pasadena, California—"the addition of the ultraviolet fills in this missing range."